Writer, activist, parent and agitator. Mayor Bill de Blasio trotted out to the podium this afternoon with a worried, serious look on his face. After President Donald Trump signed the anti-immigrant executive order he said he would, the mayor, flanked by City Council Speaker Melissa Mark-Viverito and NYPD Commissioner Jimmy O'Neill, called for an emergency press conference to spell out the city's response. Trump had just declared that so-called "sanctuary cities" like New York and other places where municipal governments vow to not prosecute undocumented immigrants for violating immigration laws, would have federal funding cut. "President Trump issued an executive order today and its purported purpose was to enhance public safety. But here in New York City and in cities across this nation this executive order could in fact undermine public safety and make our neighborhoods less safe," de Blasio began. The press conference then veered into two strange, fundamentally conflicting strains of thought. The mayor warned that police-community relations would be harmed and lashed out at the idea that the NYPD could be adversely affected by potential federal cuts. The horror! De Blasio was freaking out that the police would be deprived of "resources that we use everyday to protect the residents of this city." 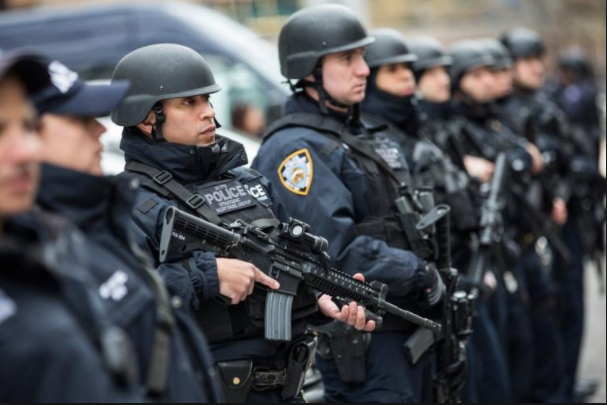 Since federal funding for the NYPD mostly falls into categories like counter-terrorism and protecting dignitaries (like Donald Trump), the idea that this is putting everyday people's lives at risk is (a) comedy (b) fear-mongering (c) both. Next, the press conference transformed into a high school pep rally for immigrant pride. Pointing to a room full of career politicians and cops, de Blasio said "this is a picture of the immigrant experience right here in front of you... this is the American dream right before your eyes." Both the Mayor and Speaker Viverito puffed out their chests with pride. They both went on about how they were going to defend immigrants, despite the fact that Broken Windows policing and the IDNYC actually hurt and put immigrants at risk everyday in the city. But hey, politically, Trump has been the best thing to happen to both of them by allowing each to claim a role of savior or 'resistance' leader. Of course the big immigrant love-fest was a cover for the real point of the press conference: saving the NYPD from budget cuts. The biggest point of concern for Commissioner O'Neill was funding for the Urban Areas Security Initiative (UASI), of which New York is the biggest recipient. UASI is a federal grant program that doles out Department of Homeland Security money to local police departments across the country. 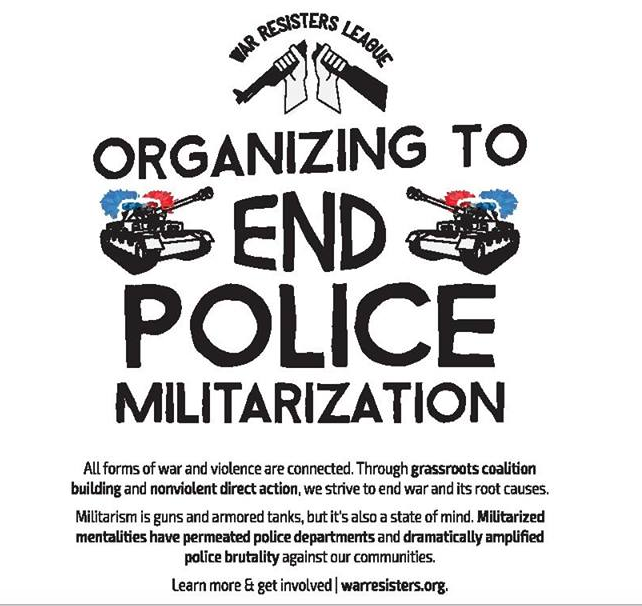 The anti-war group War Resisters League has had a long-running campaign against UASI that points out that the program has led to police departments getting their hands on things like surveillance cameras, BearCat armored trucks and armored cars. 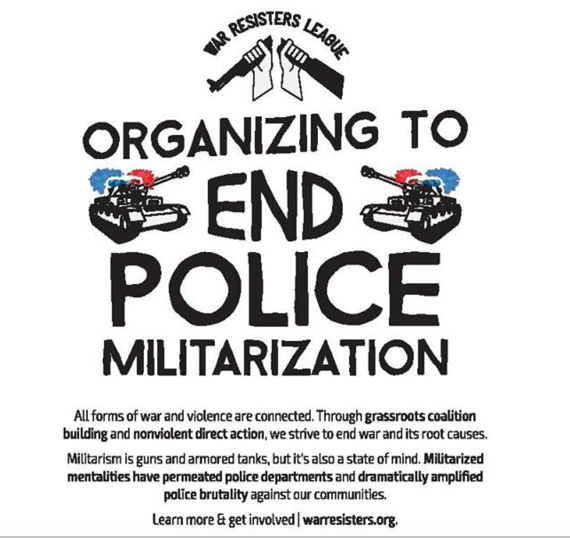 Although most people don't know exactly what police departments buy with federal dollars (like drones), it's safe to say most of it is not as much to help everyday people as it is to help militarize local police. 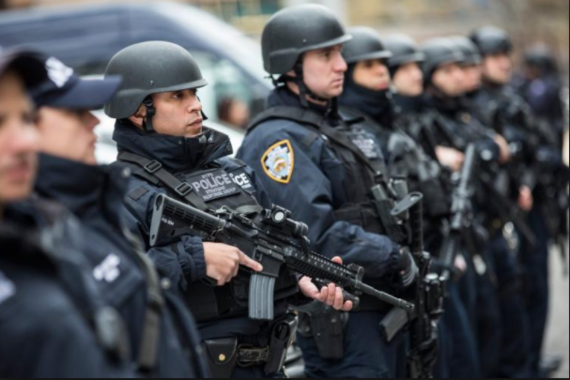 UASI also helps pay for controversial things like the Urban Shield expo, a conference where companies hawk military-grade weaponry to cops, and might partially help fund the NYPD's Strategic Response Group, an anti-terror slash anti-protester unit created by former Commissioner Bill Bratton in 2015. Now to be clear, there is ambiguity into what Trump will actually do. In the text of the order, the Trump administration makes an exemption for "necessary" law enforcement funding (section 9a). What he thinks is necessary could be anyone's guess. Still, the fact that city officials came out to sell everyone on the idea that the safety and futures of undocumented immigrants should be tied to federal funds that pump up the killing and spying power of police is sickening. In short, what the Mayor was essentially saying was "we love immigrants, that's why NYPD must be allowed to keep machine guns, spy tech and shadowy terror units." I'll pass on all that. Go ahead and cut UASI and let's all get over the idea that New York City ever really was or ever will be a sanctuary city. If we want to make it safer, let's stop giving police all sorts of guns and gadgetry. Start there.